"Delicious gluten-free apple dessert! Flaxseeds are a great way to add fiber and omega-3 fatty acids. And the good news is your kids will love it!" Preheat oven to 325 degrees F (165 degrees C). Grease a fluted tube pan (such as Bundt(R)). Beat yogurt, white sugar, 1 cup brown sugar, eggs, and vanilla extract together in a bowl using an electric mixer until smooth. Combine flour, flax seed, cinnamon, salt, cloves, and nutmeg together in a separate bowl. Stir yogurt mixture into flour mixture just until batter is combined; fold in apples. Pour batter into prepared pan. Bake in the preheated oven until a toothpick inserted in the center of the cake comes out clean, 70 to 75 minutes. Turn cake onto a serving plate. Melt butter, 1/2 cup brown sugar, and milk together in a saucepan over medium heat until sugar is dissolved, 2 to 3 minutes. Remove saucepan from heat and cool until sauce is thickened, about 10 minutes. 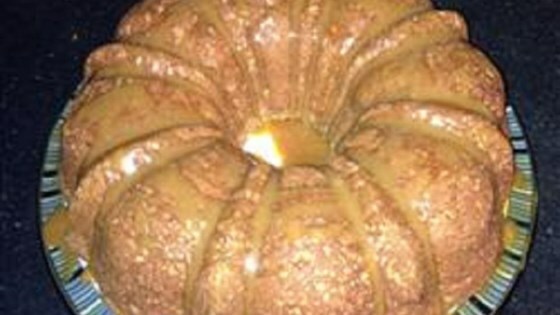 Pour sauce over cake. All-purpose flour can be used in place of gluten-free flour blend if desired.